This is a list of Public Image Resources available within Zone 7B. Click here to view/download a brochure with shirt details. If you're interested in the Polo Shirt design contact Ross at Brandmarque. Prices are based on orders of 10 or more. Contact the supplier for pricing for fewer than 10 items. Special price for Rotarians $99 each of which $20 is returned to your Club. Click here for a flyer explaining this promotion. Click here for an information sheet about the umbrella. Click here for a flyer about this book. Made of aluminium composite material with printing on 7-year vinyl to provide a durable long-lasting sign. Can be made whataver size a Club requires. Magnet, pin or brooch clips for attachment. 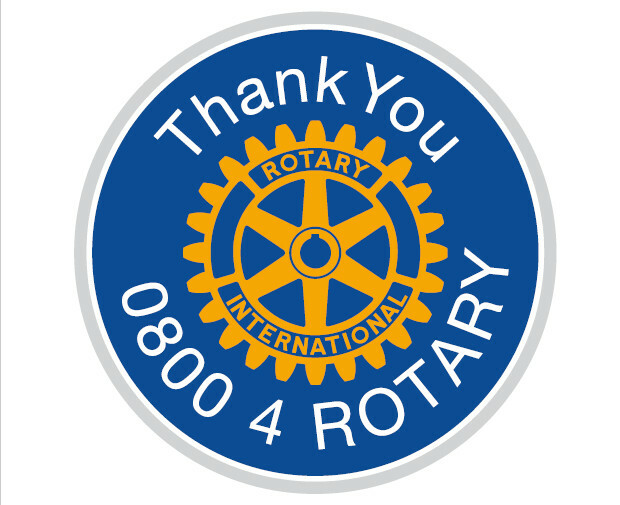 An up-to-date locally-produced brochure introducing Rotary. Measures 73mm x 105mm folded. Free, except for delivery costs. For use at indoor events. 850mm wide, 2100mm high. Click here for a flyer with details of the banners and information about their ordering and use. Click here for information about ordering. A PowerPoint Presentation in PDF format (2MB) by David Hulme. This is a series of practical guides to help 'non-experts' produce expert results. A list of Rotary videos available on You Tube or Vimeo that will support your Public Image activities. Supplied by Liz Courtney. Click here to visit the Rotarian website.